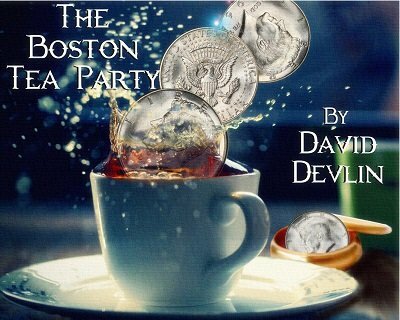 This is David Devlin's pet coin box routine. EFFECT: This routine employs four half dollars along with a copper English Penny, and a coin box. The coins are dumped out of the box onto the table. The coins may be examined by the spectators. The performer reaches into his pocket and brings out a copper English Penny, which may also be examined. The copper coin is placed aside for a moment while the performer places the silver coins in a vertical row on his right hand side. The copper coin is placed into the box, and the lid is placed on top. A silver coin is placed into the left hand. A snap of the fingers and the left hand opens to reveal the copper coin! The box is opened and the silver coin is found to be inside. The two coins traded places. This is repeated three more times each time more astonishing and more visual than the last. The final transposition happens right in the spectator's hands! At the beginning, throughout the routine, and at the end, the coins may be completely examined. The routine can be performed seated or standing. The eBook comes with the entire routine plus alternate options including a fast and easy bonus effect, the performance of which will cause everything to be examined. 1st edition 2017, 30 pages.